The R&S CMX500 Radio Communication Tester adds 5G NR signaling and RF testing to existing R&S CMW500 based LTE T&M solutions in labs. Most network operators will implement 5G New Radio (NR) as an extension of their existing LTE mobile network (NSA). As a result, mobile devices will have to function in both worlds simultaneously. That is why Rohde & Schwarz developed the R&S CMX500 radio communication tester for 5G NR that can be seamlessly integrated into an existing LTE test environment. It is also ideal for tests in 5G NR standalone (SA) mode. Most mobile network operators will initially use fifth generation mobile communications (5G) as an additional channel to further increase transmission rates. To enable developers to test their mobile devices in line with 3GPP specifications in 5G NR non-standalone mode, their test solution must seamlessly integrate into existing LTE test setups. This will make it possible to comprehensively test the signaling, RF parameters and data throughput rates of simultaneous LTE/5G connections in dual connectivity mode. Rohde & Schwarz, world market leader for LTE T&M, will present the R&S CMX500 radio communication tester for the first time at Mobile World Congress 2019. The R&S CMX500 adds 5G NR signaling and RF testing to existing R&S CMW500 based LTE T&M solutions in labs. Users who already have an R&S CMW500 or R&S CMWflexx test system for LTE measurements can continue to use them and only need an R&S CMX500 as an extension box to perform tests on 5G NR signals. This setup allows use cases to be tested in non-standalone (NSA) mode as specified in 5G NR option 3. The R&S CMX500 measures the RF parameters of 5G NR transmissions and performs protocol tests. The tester has a modular design and a state-of-the-art web based user interface that makes it easy for users to configure the tester to meet their specific requirements. Measurements in the FR2 range additionally require R&S CMX HEAD30 multiband remote radio heads (RRH). The RRHs modulate the 5G NR IF output signal of the R&S CMX500 to produce RF signals in the millimeterwave range up to 43.5 GHz for 5G NR. The RRHs are connected directly to the tester and are easy to mount on the OTA test chamber. Rohde & Schwarz will premiere the R&S CMX500 to the public for the first time at Mobile World Congress 2019 in Barcelona in hall 6 at booth #6C40. Visitors have the opportunity to see a test setup for signaling tests in development and can take a look at the R&S TS8980S3A 5G conformance test system with the R&S CMX500. The tester will be available from Rohde & Schwarz in April 2019. 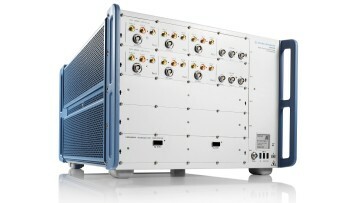 For more information, visit www.rohde-schwarz.com/mwc.